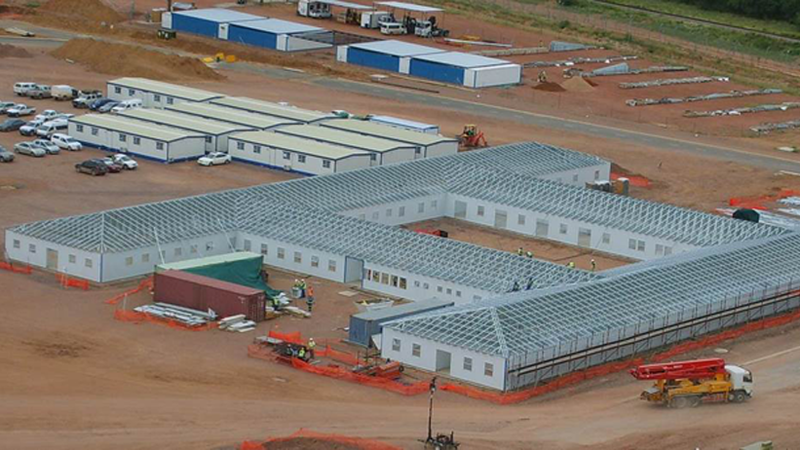 Kwikspace provides facilities to construction sites, building sites and construction camps throughout Africa. From small site offices on suburban construction sites through to massive EPC offices in the construction industry, Kwikspace has the mobile office space for you. 2 examples of mobile office solutions are those supplied to the Medupi and Kusile power plants in Lephalale, Limpopo and Witbank, Mpumalanga, respectively. Kwikspace has the modular building solutions for all construction space requirements. All Kwikspace solutions for the construction industry are available to rent or purchase. For our rental options, the mobile buildings from our rental fleet are returned on project completion. Where customers have opted to purchase the Kwikspace solution, they simply demount the structures and relocate them to the next construction camp. Little or no site preparation is needed when hiring our mobile office buildings, mobile office trailers, construction office containers or other associated park homes and portable buildings. 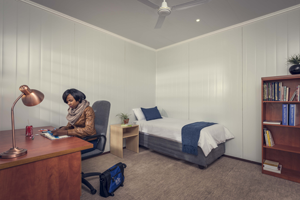 Kwikspace solutions for the construction industry include, but are not limited to: site offices, ablutions, accommodation, kitchens, diners, clinics, laundries and recreation facilities. All solutions are available as single-wide or double-wide, with all fabrication completed prior to delivery. Relocatable construction site offices to rent or own. Kwikspace site office containers provide a comfortable, convenient and cost-effective work space for any site and any application. Temporary or semi-permanent toilet and ablution facilities that can be connected into sewer system or conservancy tank. 100% relocatable. Constructed to accommodate the number of people you need them to. Long-and short-term temporary and permanent affordable, mobile park homes and modular prefab buildings tailored to the requirements of your construction site. Ideal construction camp accommodation. Kitchen equipment as well as cutlery and crockery, and dining room chairs and tables are also provided to order. 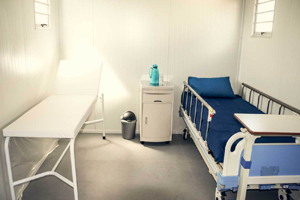 Rapidly deployed modular buildings and park homes are highly suited for use as clinics, hospital wards, dispensaries, laboratories and consulting rooms. Provide your personnel with onsite medical facilities. 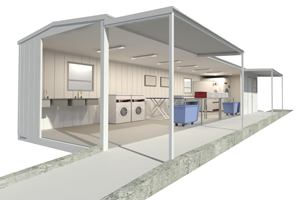 Modular buildings for use as laundries on construction sites. They can be easily connected for water intake and discharge, powered for washing machines, ironing facilities and other necessary equipment for clean clothing and laundry. Kwikspace has over 50 years’ experience in supplying units for construction purposes. 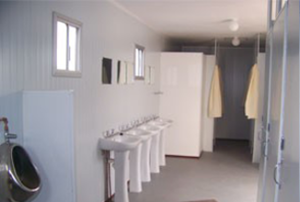 Rent your site offices, site ablutions, camps for remote sites, pioneer camps and drilling camps. 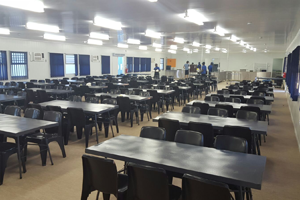 We provide a full range of prefabricated rental solutions for remote camps and construction projects, including accommodation, kitchens, diners, recreation buildings, gymnasiums, offices, changing rooms and more. Our single-wide prefabricated mobile units are available in 3 or 3.5 m. Unit lengths are available in 6, 9, 12, 15 or 18 m and units are joined on site. Kwikspace’s fleet of rental buildings can be installed in multiple layouts. 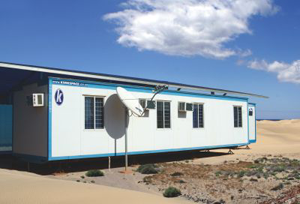 From a single modular unit for storage or office space, to complete accommodation camps, we have the capabilities to meet your requirement with a complete solution that includes all services, furniture fittings and equipment as required, providing the ideal solution for any construction camp or construction site. Our double-wide prefabricated mobile units are available in 7 m widths. Unit lengths are available as 6, 9, 12, 15 or 18 m and units are joined on site. From a single modular unit for storage or office space, to complete accommodation camps, buildings from Kwikspace can be installed in multiple layouts. Our comprehensive solutions include all services, furniture fittings and equipment specified, providing the ideal solution for any construction camp or construction site. Multi-slice, also called Kwikspan provides Kwikspace with the flexibility to supply a wide range of building sizes for all building types. These buildings are fabricated in the factory in modules, ideal for camps of all kinds, construction camps included. Kwikspace also conducts site-build projects. Using any of its well-proven panel technologies, the specialists in modular buildings supply rapid accommodation solutions for permanent or temporary applications in remote locations or where permanent buildings are required. These buildings are NOT supplied as large modules, but instead Kwikspace offers bespoke designs to suit your requirements. Kwikspace is the leading South African supplier of Alternate Building Technology (ABT) / Innovative Building Technology (IBT), also called Green building solutions. Kwikspace has one of the largest modular building rental fleets in South Africa and in southern Africa. We provide quick results for your short-and medium-term construction project requirements. 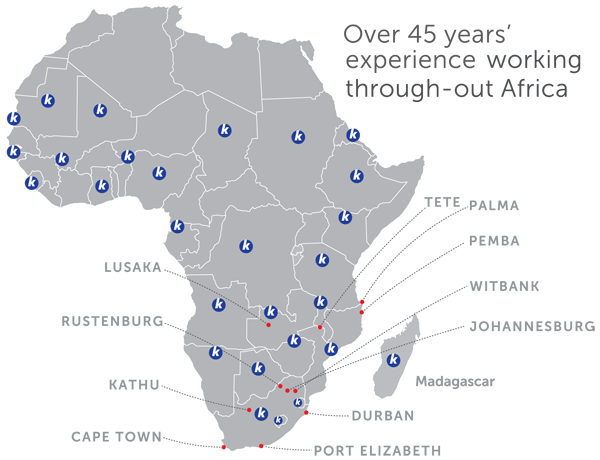 Perfectly positioned to service the whole of South Africa and most of southern Africa, we have rental fleets in the Eastern Cape, Gauteng, KwaZulu-Natal, Northern Cape, Lesotho, Mozambique and Zambia. 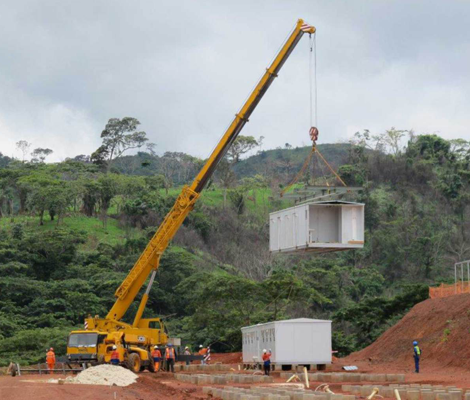 This means that wherever in Africa your construction projects take you, Kwikspace has the temporary or permanent modular building solution for you. Not only does Kwikspace use thicker steel grade than the industry norm, our products are insulated with polyurethane foam, providing superior strength and thermal properties than industry-standard expanded polystyrene (EPS). The Kwikspace insulated panel is coated in 0.5 mm Aluzinc painted steel, providing improved corrosion resistance and increased durability and longevity of your prefab building. Need onsite space for construction quickly? Why use Kwikspace – specialists in space for the construction industry? Speak to us about your construction site building requirements!